Electromagnetic pulse weapons that can paralyse a country in a nanosecond are already in the possession of several states. By 2015, North Korea is likely to acquire one. If you are not sweating, check your pulse. A nuclear weapon explodes 300 km above Nebraska, the geographical centre of the United States. The blast is far too high to kill people by heat or radioactivity. But it does something far worse – it sends the world’s most advanced country into the Stone Age. This isn’t science fiction. The technology for launching this version of Armageddon exists and is ridiculously low tech. Even an ordinary, low-yield nuclear bomb exploded in the upper atmosphere by terrorists, with help from dysfunctional nuclear powers such as North Korea or Pakistan, would unleash a deadly electromagnetic pulse (EMP) that will take only a nanosecond to knock out an entire country’s electrical grid. That means every microchip will be fried and all electronic systems will fail. The result would be “fundamental collapse” as the United States EMP Commission describes it. All phones and mobiles will stop functioning, the transport system would come to a halt, the banking system, airports, food and fuel distribution systems would collapse. The fabric of modern society would be ripped apart. If the Boston bombings have proved anything it is that low tech warfare can bring a high-tech nation to its knees. Two Chechen brothers, not very well-equipped or professionally trained but nevertheless motivated by Islamic zeal, forced an entire city to close down. Pressure cooker bombs are cheap; flying stolen aircraft into skyscrapers is free (other than the cost of flight training) and sending a bunch of raiders into a modern metropolis (as the Pakistanis did in Mumbai) takes only a few thousand dollars. But at the end of the standoff, the terrorists always lose and often die. No modern state has ever buckled under terror. Terrorists and terrorist states, therefore, want something that will give them more bang for the buck. It makes you wonder, what next? The Russians were the first to understand the implications of EMP as a weapon. Soviet physicist Andrei Sakharov proposed using this principle in a bomb in the 1950s. 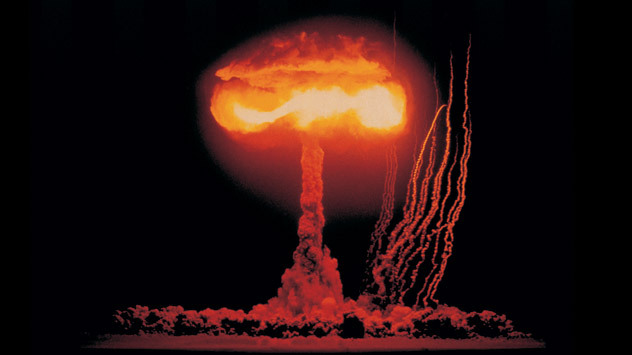 On October 22, 1962, during one of their ABM tests, the Russians detonated a 300 kiloton hydrogen warhead (20 times more powerful than Hiroshima) at an altitude of 300 km over Kazakhstan. The blast deliberately targeted two cable lines. The first one was the 550 km East-West telephone line – all the fuses in the line which was 7.5 m above the ground were destroyed. The second, the 1,000 km Aqmola-Almaty power line, carried electricity from a power station in the city of Karaganda. It was a lead-shielded cable protected against mechanical damage by spiral-wound steel tape, and was buried at a depth of 90 cm. This cable succumbed completely to the EMP within seconds of the blast, overheating and setting the power station on fire. The United States military realised EMP’s potential as a weapon the same year, in the Starfish Prime test of a much larger 1.44 megaton warhead at a height of 400 km over the Pacific Ocean. The pulse knocked out street lights and damaged telephones in Hawaii. Four days after the explosion the UK satellite Ariel was unable to generate sufficient electricity to function properly. People are more vulnerable today because virtually everything now runs on microchips, which are a million times more vulnerable to a power surge than the thermonic valves used in electronics in 1962. Today most people around the world are unable to function normally without access to mobile phones and computers. A nuclear explosion in the upper atmosphere releases EMP that spreads out and radiates a large area underneath it. The area affected by the EMP depends on the height at which it is detonated. The higher in the atmosphere the explosion occurs, the larger the radius of damage. It’s like a powerful lightning bolt that surges into your house. The strength of the pulse – 30,000 to 50,000 volts per metre – is more than enough to burn your circuits and make your television set explode. Just like in the movies. Such damage cannot be repaired – everything would need to be replaced. But wait, even that won’t be easy. According to one study, if the United States lost its large transformers, 40 per cent of the country’s population would be without electrical power for as long as four to 10 years. That isn’t farfetched as it sounds. Several countries, including the United States, no longer manufacture large power transformers. They are all sourced from abroad. At a US Senate hearing on March 8, 2005, Dr Lowell Wood, astrophysicist and Commissioner of the EMP Commission, declared: ‘‘And when you want a new one, you order it and it is delivered – it is, first of all, manufactured.... Typical sort of delays from the time you order until the time you have a transformer in service are one to two years, and that is with everything working great. According to a report prepared for the United States Congress, Russia and China are now capable of launching a crippling high EMP strike against the United States with a nuclear-tipped ballistic missile, and other nations, such as North Korea, could possibly have the capability by 2015. Other nations that could possibly develop a similar capability over the next few years include France, Israel, India, the UK and Pakistan. China could either blanket the area over Taiwan to paralyse the country or above a US Navy aircraft carrier to cripple carrier groups. Israel can despatch Iran or any Middle Eastern challenger to the Stone Age. And what North Korea can do is anybody’s guess. EMP can be produced on a smaller, non-nuclear scale using a device with batteries or chemical explosives. A group of Russian scientists from Tomsk, Yekaterinburg, Nizhny Novgorod and Moscow have developed a series of unique compact generators capable of producing high-energy pulses of hundreds and even thousands of megawatts, Yuri Zaitsev, an adviser at Russia’s Academy of Engineering Sciences, wrote in a 2007 article. The United States has also ramped up its research on non-nuclear EMP weapons. In October 2012, Boeing tested a missile system that does not use any explosives, thereby limiting damage to its intended goal of directing microwave energy that can cause instant blackouts. Aimed at taking out Iran’s nuclear plants, it is codenamed CHAMP – Counter-Electronics High Power Advanced Missile Project. However, there’s one bomb that could be the ultimate doomsday weapon – an ordinary nuclear warhead packed with common cobalt. The bomb transforms the cobalt into highly radioactive cobalt-60, which has a half-life of over five years. You can run but you can’t hide from such a weapon because unlike the radioactivity of Hiroshima type bombs that remains local, the radioactivity of cobalt-60 would spread around the world and slowly kill all life. The average supermarket stocks food for two days, and regional food warehouses may have a few weeks supply. What are you going to do for the next five years? Compared with the madness that modern maniacs can unleash, the horrors of WWII and 9/11 are but mere sideshows.